Auto-connect setting causes Remote HD to automatically connect to the last successful connection on startup. This setting is turned on by default. A bug in auto-connect algorithm causes incorrect initialization of the networking layer which causes poor trackpad performance. This bug will be addressed in the next update. Open Remote HD Settings and turn off "Auto Connect" setting. Installation of Remote Helper automatically configures the Windows firewall on your PC. Usually no extra configuration is needed. Tip: If you are having troubles connecting, try temporarily disabling the Windows Firewall and see if you can connect. Make sure that Remote Helper is running on your PC. Timeout Error can also occur due to an incorrect firewall configuration even if you added an exception for Remote Helper. Please disable it temporarily to see if it resolves the problem. Antivirus software on your computer can also interfere with incoming traffic. Please disable it temporarily to see if it resolves the problem. If you have cisco vpn client installed on your computer, make sure that its stateful firewall is turned off. Make sure that your iPad/iPhone/iPod touch is connected to WiFi and shows the WiFi symbol in status bar of the device. If your iPad/iPhone/iPod touch is on a public or external network, try manually putting in the host and port information into Remote HD. If you are still unable to connect, and your computer supports WiFi, try setting up an Ad-hoc networking between your computer and your iPad/iPhone/iPod touch. Follow these instructions to enable audio streaming on your PC. Ensure that Network Event Receiver Plugin is listed under Autostart and is not disabled (crossed). 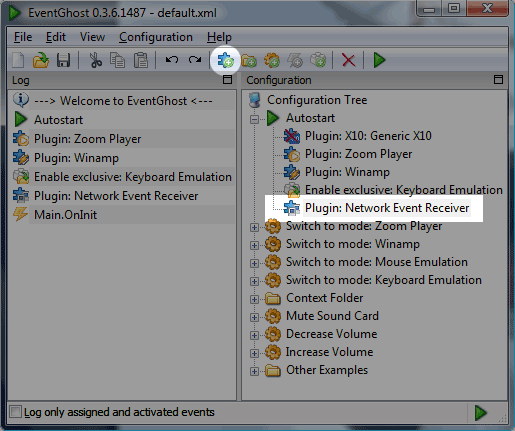 Finally, open Remote Helper settings and enable "Integrate with EventGhost" checkbox. You will notice a new EventGhost tab in Remote Helper where you can specify the Network Event Receiver port and password setting in there. Once integration with EventGhost is enabled, Remote Helper will start forwarding all Remote HD events to EventGhost. Make sure that multimedia key support is enabled in Winamp. This setting can be turned on from Winamp Preferences > General Preferences > Global Hotkeys. Under the hood, Remote HD Lite is the same product as the full version of Remote HD, with some key features disabled. When you purchase the full upgrade from the iTunes store, Remote HD Lite enables these key features. When you purchase for the second time, iTunes will ask you to confirm a payment with full upgrade price. Go ahead and confirm the payment. iTunes will then prompt you that you already own the upgrade. It will deliver the upgrade for free. When watching a movie, leave Remote HD running. Your device's display will go to sleep but Remote HD will remain connected. Control the volume of your PC using the hardware volume buttons, without even unlocking the device!